Kareena Kapoor is usually on trend and stylishly dressed. So I thought I would pick out some styles from the actress that are uber stylish and look so good! This is from one of her recent appearances for an event in Calcutta (Kolkata). She is wearing a very stylish 2 piece outfit. The top is a tunic that also has a cape style top part and the bottoms are either a skirt of relaxed fitted pants. The embroidery on the cape is very trademark of the designer - in golden zardosi on a black base fabric. Does the mommy to be not look stunning? At another recent appearance, Kareena wore a very stylish long olive coloured Tunic. Why do I like this? because it is simple and she kept the look so stylish. She just added a necklace and a clutch to complete the look. I am not sure of the designer. I am starting to appreciate maternity fashion a little more, and am thinking that it can be done very stylishly if one looks at the inspirations from Kareena. I can honestly say, rock on girl! How to wear Indian earrings ? Indian earrings are easy to match because of different colours, different designs and a large panel of models ! With innovation by each designers, you can easily find your perfect look with dresses and accessories. Shaheen Abbas looked stunning at the launch of her jewellery line, wearing a fiery red Amit Aggarwal gown from his couture collection. She added a Pinky Saraf clutch and wore her own jewellery. Priyanka promoted her movie in Dubai, wearring a black and white dress with only gold Indian earrings for accessories. Kareena Kapoor Khan has been honoured by Asian Sunday newspaper and Members of Parliament for her contribution to the global entertainment industry, at the Launch of the newspaper's London Edition, taking place at House of Commons on 29th October. She wore a red dress with silver Indian earrings for a traditional and so glamorous look. Saif Ali Khan is shooting for his new film currently in Michigan, and we hear that Kareena Kapoor flew down several days ago to join him and the film crew. 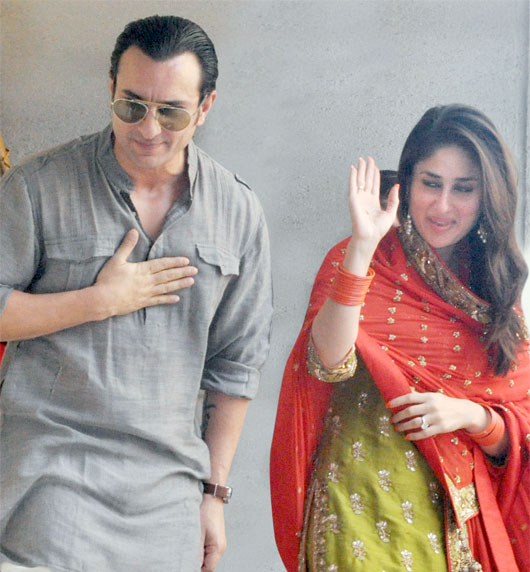 Although it's clear that Kareena's visit was to spend her husband's birthday with him, there is also speculation as to whether she will actually play a part in the film. Whether this is true or not, we absolutely love her choice of Indian clothes in this picture snapped of her on set. Kareena Kapoor is an Indian actress, daughter of Randhir Kapoor and Babita, also actors. Saif Ali Khan, 42, is illustrated in numerous productions including comedies Bollywood Kal Ho Naa Ho, Hum Tum and Salaam Namaste. He found success with Omkara, an adaptation of the play Othello by Shakespeare in which Kareena plays. 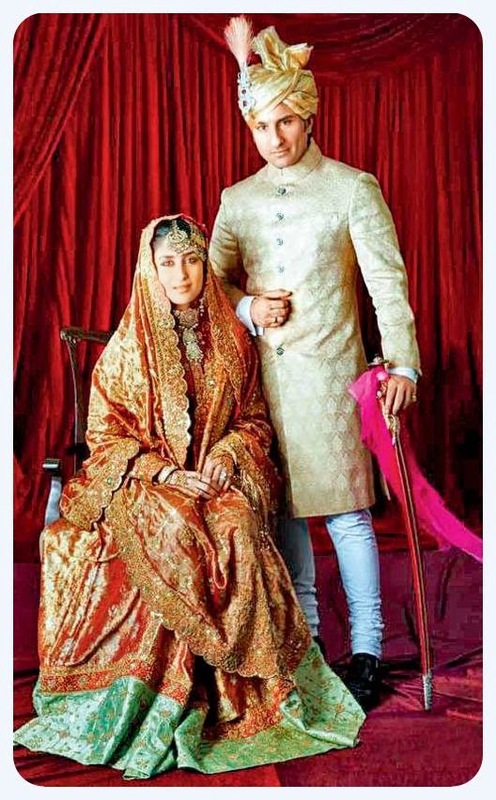 They were married October 16, 2012, in Bandra, hometown of Saif. 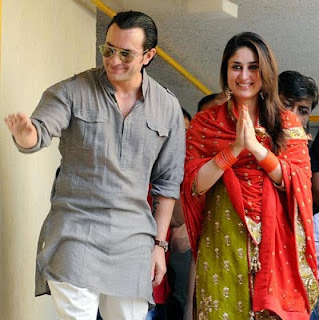 The marriage took place in accordance with the traditions, where Kareena's dress resembling that of his stepmother when she married, it was not a wedding saree, wedding or a lehgas but salwar kurta one, representing the traditional indian bridal wear, with his green pants and red stole. 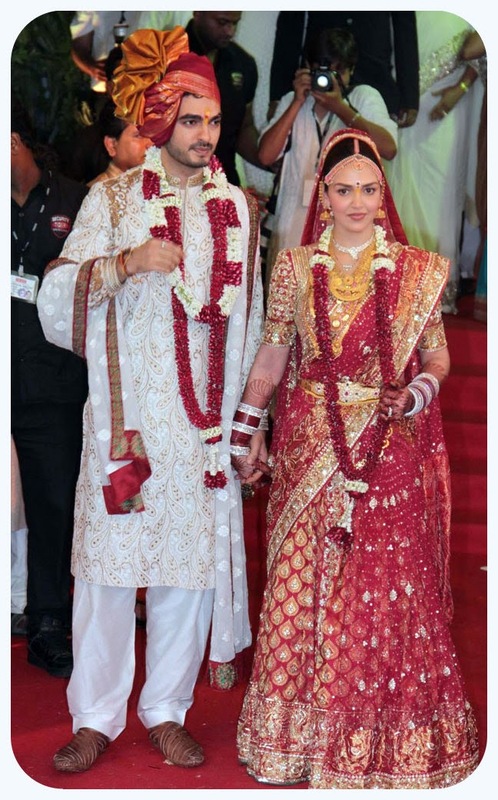 This is one of the most iconic Bollywood weddings, after that of Ashwarya Rai and Rabishek Bachchan in April 2007. 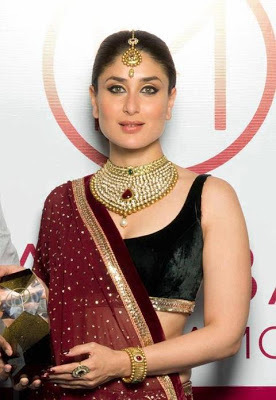 Kareena Kapoor Khan has been in charge of being the icon of the jewellery brand Malabar Gold & Diamonds. The beautiful lady known for her elegance and her performances on screen has recently started a new project. At the signing ceremony, Kareena looked like an Indian bride, with a dress very similar to a wedding saree. The jewellery brand is famous for its style, beauty, and design that correspond to the sublime Kareena Kapoor's personality.